Let’s be honest, getting to the annual NCECA conference costs money, as do any kind of professional development opportunities. Many of us budget for it every year, others apply for grants and scholarships, some are fortunate enough to be sponsored by work or schools. A lot of attendees have been holding fundraising efforts, both as groups and individuals. I’ve seen these range from selling pots on Facebook and Etsy to Kickstarter campaigns and bake sales. One school asked for artists to donate pieces of art for auction to raise money for their students, who had work in the K-12 show, to attend. It’s an opportunity to get creative, and to involve the community, friends and family. All of this furthers the mission of NCECA–education. 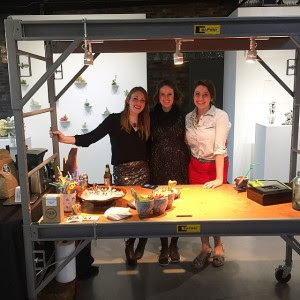 Coinciding with the opening of Lauren Mabry’s solo show at the Belger Crane Yard Gallery, the current Red Star resident ceramic artists presented their fundraiser, Sip Shop. I took some time to speak to the residents involved about how it worked. The idea for Sip Shop came from resident Brice Dyer’s stint at St. Pete Clay in Florida, where Lydia Johnson hosted the Grown Up Lemonade Stand fundraiser. The idea was for all of the residents to create cups for sale, both online and at the event. Patrons who purchased their cups and attended theopening, also received a free adult beverage in their new cup. was responsible for helping to market the sale on their own social media feeds, though they created a timeline as not to overwhelm followers. School of Arts and Crafts first annual “Pentaculum” event, donated multiple collaborative cups he created with other artists during the week-long residency. Belger and Red Star were incredibly supportive of the endeavor, giving use of gallery space, helping with setup and displays. Brice Dyer says Sip Shop would not have been possible without their help. Resident Catie Miller said her favorite part of creating Sip Shop was being pushed to create new work. She worked on a new design of cups that was exclusive to Sip Shop. Jamie Bates Slone, normally a sculptor, got to explore functional ware, and particularly enjoyed learning to set up a live event in the gallery. As an attendee, I can say that Sip Shop was a splash. It was well set up, smoothly run, and quite a bit of fun. From speaking to all the participants, I can say that this is exactly the type of activity that programs should encourage, as the relationships formed between the residents and the lessons learned from the experience have already made their time at Red Star a success. Community is key in any group environment, and community will enhance the work and experience of these residents. Residents: Jamie Bates Slone, Catie Miller, Maura Wright, Brice Dyer, and Lea Griggs. The follow-up: I talked to the residents several months after Sip Shop to find out how they felt about it. Here’s what they had to say. Conclusion? Make more cups. It was a huge success for the residents monetarily, professionally, and boosted camaraderie. What’s happening with ceramic artists in your community? If you are involved in creative collaborations that generate resources for professional development for artists and would like to share your experiences, NCECA would love to hear from you. Write to communications@nceca.net with your stories and you could be featured here!